As a small business owner, you know the value of doing more with less. However, when it comes to your advertising and marketing tools, you don’t want to compromise on quality just to save a buck or two. So, you will typically need to choose between free or low-cost tools with minimal capability, and robust packages that cost a fortune and provide the functions you need along with an expansive catalog of features that you’ll never use. 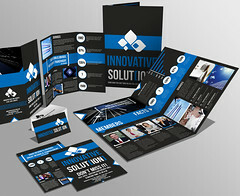 However, now that computers are faster and bandwidth is increasing, using online desktop publishing tools has become a viable option. There are a number of offerings available, most with a free version, which may just provide all the functionality you need along with the convenience of being able to work on a project from anywhere. Photoshop Express Editor: A lite version of the industry standard for photo editing, Adobe Photoshop, this online tool enables you to upload any .jpg file from your computer, edit and enhance it, and then save it back to your computer. No registration is necessary. Simply access the tool and start working. Sumopaint: A very robust online photo editing program. In fact, it is closer to the full Adobe Photoshop than is the Photoshop Express Editor. You can start with a blank canvas and begin building an image, or upload a photo from your computer to work on. You can use multiple layers, effects, filters, adjustments, and palettes. Save files to your computer in Sumo format to edit them again later, or flatten and save as .png or .jpg files for use anywhere. Ribbet: A user-friendly photo editor and collage maker. No registration is required to use the free version of the tool. Simply select “upload a photo” or “create a collage” to start working. It includes in-application tutorial help that will assist you with creating your projects. Photo editing includes basic image adjustment tools and the ability to add text, stickers, and frames to your images. The Collage mode enables you to create multi-image designs. You can save images in .jpg and .png format. Lucidpress: A full feature desktop and online publishing tool. With registration you get access to a library of templates and the design tool. Use it to create flyers, brochures, newsletters, advertisements and more; then export as .pdf, .png or .jpg for printing and publishing. You can also create interactive catalogs and brochures that can be embedded on your website. The interface is fairly intuitive, but the tutorials are a great place to start. Formatpixel: Another option for “Web Top Publishing,” this online design package is a good choice if you are creating an interactive piece for your website. The free version lets you have only one project, so it isn’t a good choice if you’ll need more than one active at a time. However, use it to create catalogs with animated page objects and nicely implemented page turning. Once you publish your project, you’ll get code to embed in your website. An added bonus is the ability to get viewing statistics for your project.